Shutterly Fabulous based on the south Coast of the UK in Brighton and Hove has customers from all over the South East and London. 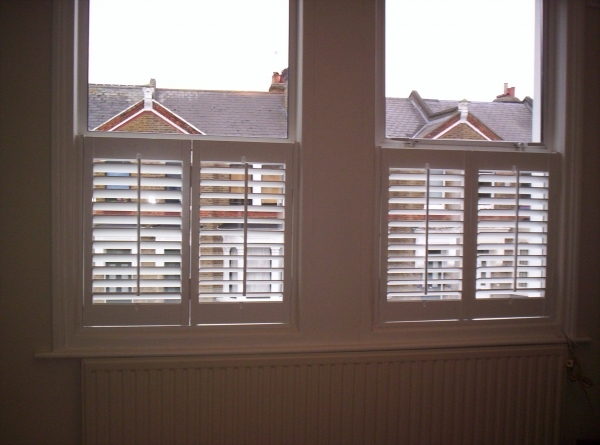 This customer in Dulwich, in the London borough of Southwark, felt compelled to send in a picture of how their wooden window shutters have transformed their property. Typically, their style of house has various different styles of windows, all of which have been measured, and fitted out by Shutterly Fabulous. This Dulwich property is a fantastic example of how you can tie in a multitude of design options of wooden window shutters into your home, keeping them looking uniform by using the same colour and style, but using different designs depending on the function of the room. This may not be the choice for every property, but it works well here in this Dulwich home. The number of panels for each different style of window has been varied to fit in with the window type, and for privacy, full height wooden window shutters have been used downstairs. As the property doesn’t meet eye height on the upstairs level, café-style wooden windows shutters have been used upstairs.